What could be more beautiful and awe-inspiring than a powerful seascape painting hanging on your living room wall? We humans have a fascination with the sea. Scientists tell us that it's because all life evolved from the sea. I don't know if that's true or not, but you know how relaxing it is sitting on the beach staring out at the ocean. Listening to the crashing waves brings a sense of peace and fulfillment. So, as artists, the next logical step is to learn to paint seascapes. After all, those who do paint seascapes capture, perfectly, the feeling we get when we're at the ocean. But there's a problem, isn't there? Seascapes look so difficult to paint. We know how to paint mountains and trees and landscapes. Heavens knows, there are tons of videos of how to do that all over the place. Well, it does take special skills to paint seascapes. Only a very few folks know how to do it and do it well. So you might doubt you have the skills to create beautiful seascapes. You might be wondering how much different seascapes are than, say, landscapes or florals or other types of paintings. At Alexander Art, we believe that you should be able to paint anything you want to paint. Nothing should hold you back from creating any type of painting you desire. There is a secret to painting beautiful seascapes. It is a secret jealously guarded by those who know how to paint them. We're going to share that secret with you in just a few moments. First, a little background about this new course. 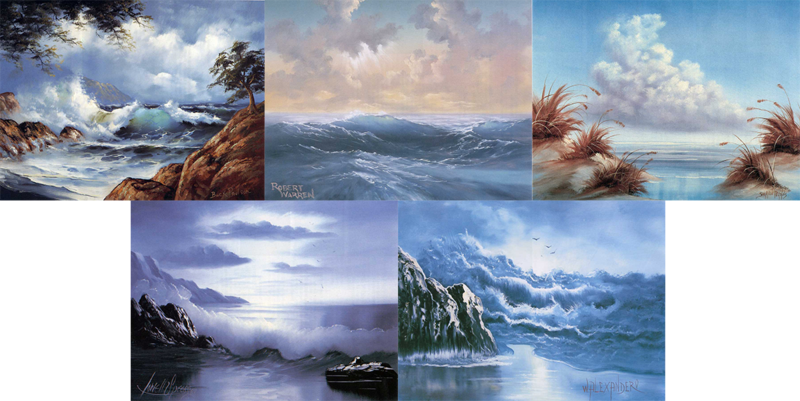 Bill received a lot of requests to do seascapes on his television show. We have many of them on our site. When Bill retired, Alexander Art featured other artists like Lowell Speers, Robert Warren, and Buck Paulson. The requests for seascapes never stopped. In the early 1990's Alexander Art called on Buck Paulson's seascape expertise. We asked him if he could create a special video that would teach fans of the program how to paint beautiful seascapes. So Buck set to work designing a seascape painting that would allow him to teach the critical principles that seascape painters needed to know. The finished product was a one hour video called "Sunset Power." Learn the principles of great painting. Learn to paint seascapes like a master. But The Buck Didn't Stop Here! Buck went further and created an additional four videos that covered techniques he felt seascape painters needed to know. Not only were these techniques important for seascapes, artists could use them with any type of painting. In later years, Buck admitted that his seascapes video course was one of the best videos he every created. We have to agree and we think you will too when you see the depth and detail Buck goes into to help you become a great seascape painter. We asked, "How could we make this course even better? After we created the course, we asked ourselves, how could we make it even better? After all, Buck was not the only seascape artist featured on Bill's TV show. So we scoured our archives and our artists to find a wide variety of additional videos we could include. We wanted to give painters of all skill levels projects that would allow them to be successful with seascapes. So we put together an additional five (5) videos from artists like Lowell Speers, Robert Warren, Sharon Perkins, and, of course, our very own Bill Alexander! Learn the principles of great art. Everything you need to become a great seascape artist is right here in this course! We Didn't Even Stop Here! You see, the big secret to painting seascapes is that there is no secret! Painting seascapes are no different than painting landscapes. The principles are exactly the same. Everyone thinks there are special ninja tricks that only seascape artists know. They are wrong. That's why seascape painters are skilled at a variety of painting genres from still life to florals and from portraits to landscapes. And that's what you're going to learn in this new seascape course. You're going to learn the principles of creating great art. While this course focuses on seascapes, you'll use exactly the same principles you learn in this course to make the rest of your paintings better. For example, Buck's 1-2-3 Principle will apply to every single painting you create, not just seascapes. That's why we included five more projects (in downloadable PDF format) that you can use to practice the techniques you learn from this course. It's all here and much, much more. Enroll today! Look what we discovered in our archive! We included more seascape technique videos from Robert Warren. Bill, and all the artists at Alexander Art taught principles over techniques. Sure techniques are important but understanding the principles that create great art are more important. Every one of the included technique videos and every one of the paintings is built on solid painting principles. Once you master these principles, you will be able to paint anything! Here's what we mean. Take a look at this video clip from the course. Robert shows you how he sets up the background colors to paint this gorgeous seascape. Here's what we've got for you! Everything you need to become a confident, competent seascape artist is in this course! Over ninety minutes of solid instruction will help you become a successful seascape painter. Sharon Perkins, Robert Warren, Lowell Speers, Buck Paulson and, our very own Bill Alexander guide you through more projects to help solidify what you've learned in the course. Written instruction files in PDF format give you even more projects with which to hone and perfect your seascape skills. Learn how to apply details to your seascape paintings as only Robert can teach you. These videos will teach you the proper way to prepare your canvas prior to painting, how to save hundreds of dollars on canvas, how to cleanup non-toxic and environmentally friendly, and much more. Learn by doing is the best way to learn anything. From video instruction to hours of projects, you'll have everything you need to become a successful seascape painter. Share your paintings in total confidence with folks who are learning just like you. No trolls, no snide remarks, only great help and feedback from a great group of folks. Ready to become a successful seascape painter? Enroll now in one of the most comprehensive courses we've ever created! We thought long and hard about how to price this course. We wanted to make it as accessible to as many aspiring seascape artists as possible. We wanted to price is so that you won't have to spend a single penny on another seascape course. Because you won't find one as comprehensive or as complete as ours. We don't offer you just one artist but seven. You don't get just one seascape painting but eleven. You get bonus videos that will help you with all your paintings, not just seascapes. The total cost of this program is only $299.00. Click the button below to enroll in the course. You'll go to a checkout page. If you're already logged into our site, your account information will be pre-loaded. All you'll need to do is enter your payment information (PayPal or Credit Card) and within minutes, you'll have access to everything in the course. Let's Get Started Painting Seascapes! Sitting around wishing it were so won't make it happen! If you have any difficulty signing up for the course, call Dawn at (360) 686-1102 or contact our help desk at support@alexanderart.com. We'll get your information and get you signed up as quickly as humanly possible. Click the link below and we'll look forward to seeing you inside The Seascape Course. 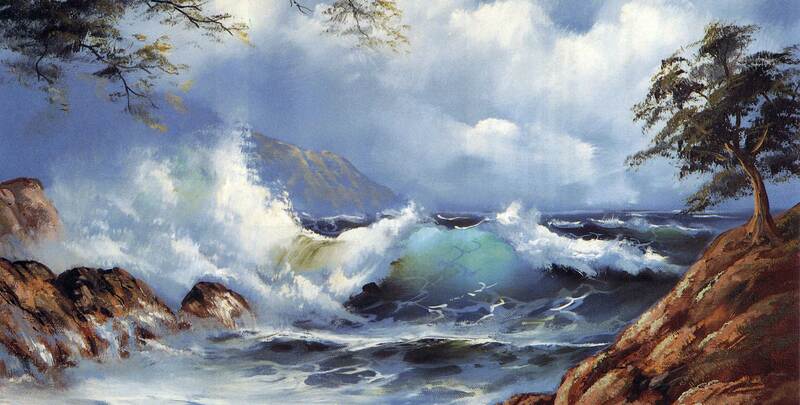 Stop worrying whether you have the skills to create beautiful seascape paintings. And Buck, Bill, Robert and the rest of our artists will prove it to you. Become the confident, successful seascape painter you've always wanted to be. Learn to paint seascapes right from master artists and master teachers. 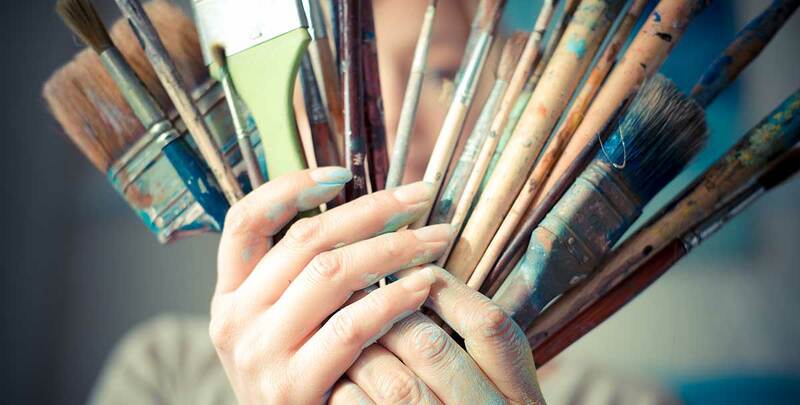 Invest in your future and start painting now! Take advantage of this terrific offer now!